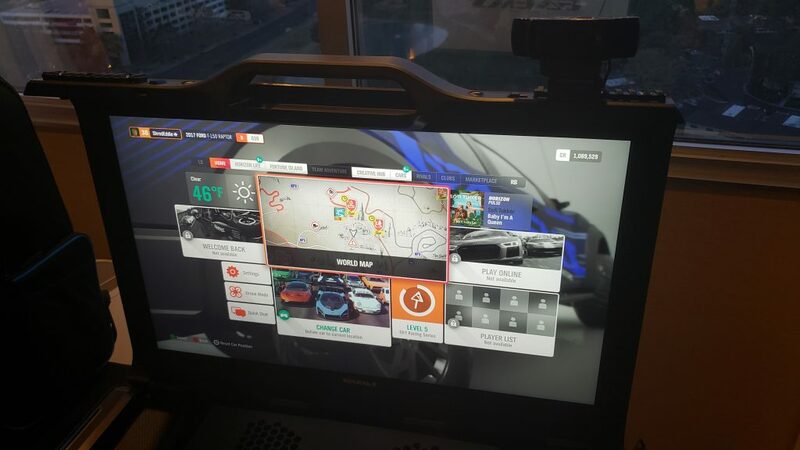 Tucked away from the busy convention floor of CES 2019, GAEMS dedicated a private suite to showcase the next evolution in their personal gaming environments. Having owned one of their earliest models, the Sentry many years ago, I was eager to check out what they had in store. The aforementioned Sentry unit was used in many of my tournament travels over the years, and has been tossed around many aircrafts and TSA checkpoints. It held up quite well, though I’ve always disliked their first-generation TN panels and OSD. Their newer models showcased at CES 2019 look and feel so much better. The first product I got to look at was the Sentinel. This model was announced back in December 2018, however it didn’t go on sale till early January 2019, during CES week as a matter of fact! It provides numerous improvements from their earlier models, in a much more manageable form factor. 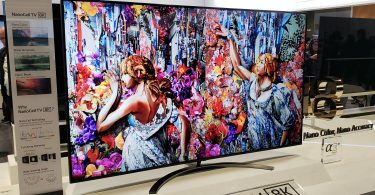 The Sentinel no longer features a TN panel, and instead is fitted with a 17.3″ IPS display. The improved image quality and viewing angles were immediately apparent. As this unit is designed for console gaming, it tops out with a 60hz refresh rate, and provides a 5ms GTG response time (with overdrive). We’re looking at a max resolution of 1080p (1920 x 1080) pixels, which is a step up from earlier 720p models. Additionally, two headphone jacks are present to give each player their own audio source. For those who don’t need to use headphones, a pair of 3W stereo speakers are also within the unit. The most important part of the Sentinel is the improved design. It just feels so much smaller and compact than earlier models, while still retaining a big display. When folded up, it’s also quite an improvement. It does this while still being able to house the PS4, PS4 pro, Xbox One S, and Xbox One X.
I couldn’t notice input lag during my short time with it, however the only game I got to try was Soul Calibur VI, which I don’t play often. I did receive a review unit of the Sentinel, so please look forward to thorough testing in the very near future. The Sentinel retails for $349.99, and is already on sale via Amazon. 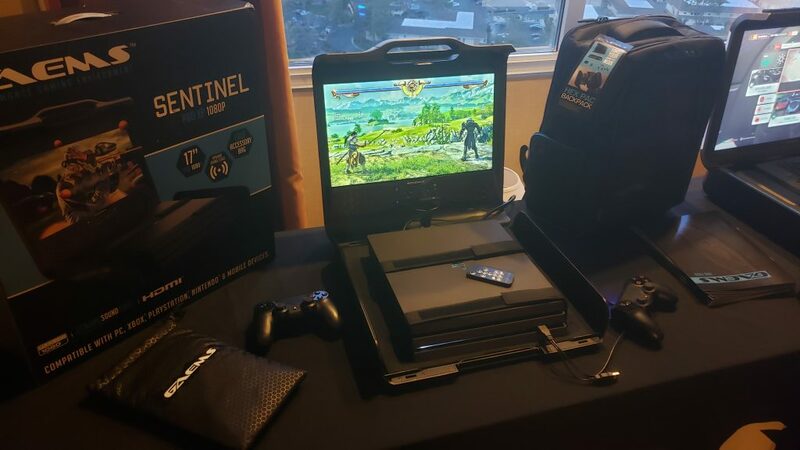 On a completely different spectrum, GAEMS also brought a prototype to CES 2019 with a completely different focus. The Guardian is a behemoth of a product that’s mainly focused on traveling streamers and those who want a grander experience (with a deeper pocketbook, of course). 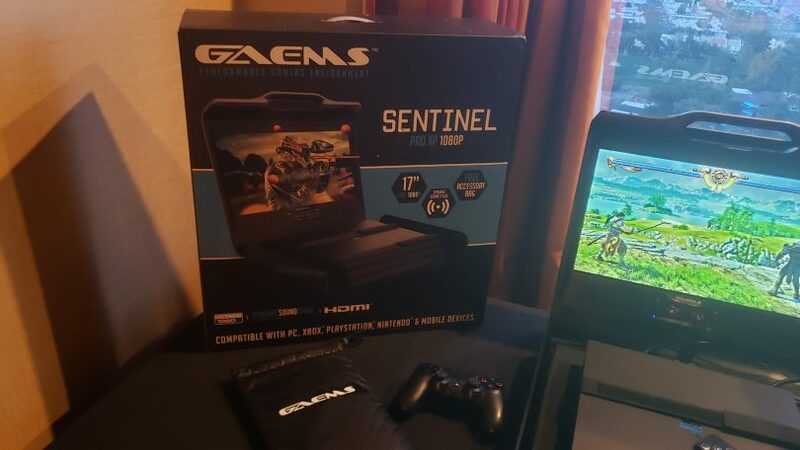 The Guardian is a significantly beefier product, featuring dimensions of 23.45″ W x 16.9″ D x 4.79″ H. It weighs a hefty 18lbs, and due to its size, feels a bit more fragile than other GAEMS products. This one will definitely turn heads at the airport. In terms of specs, it features a 23.8″ IPS panel with a 1440p (2560 x 1440) resolution. The refresh rate is 60hz, and its max brightness is around 300 nits. Unlike the Sentinel, the response time on the Guardian’s screen is around 9ms GTG with overdrive. It features a HDMI 1.4 input and output, as well as a USB 3.0 hub. This prevents you from losing the USB port on the back of the console, as it’s difficult to access once placed into the GAEMS unit. The sound quality sees a significant improvement from other GAEMS units, featuring a pair of 9W stereo speakers with a 12v power amp. GAEMS claims the Guardian provides “Dynamic Soundstage” in their press materials, which should translate to much better sound quality overall. All of this information would be pointless, however, if I didn’t get to play on it. In my short time with Forza Horizon 4, playing on this unit felt really good. It’s interesting actually; the screen is only about 24-inches in size, which is small by monitor standards, however it felt massive while I was playing on it. Maybe its because it was sitting next to the smaller units which gave it a sense of scale, but I can totally see myself getting immersed if I took this thing around during some trips. 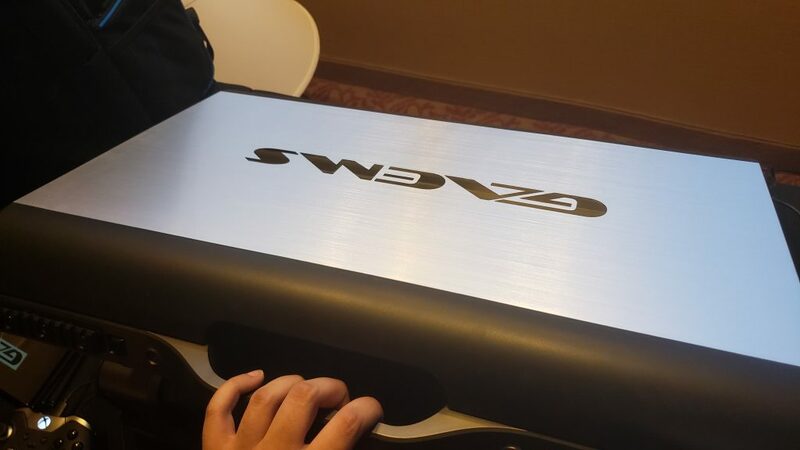 It felt responsive, and viewing angles were great. While I can’t provide concrete input lag numbers, I’m expecting this unit to feature low input lag like the rest of GAEMS’ lineup. Hopefully next time they’ll have Tekken 7 on board for me to test some hard combos. 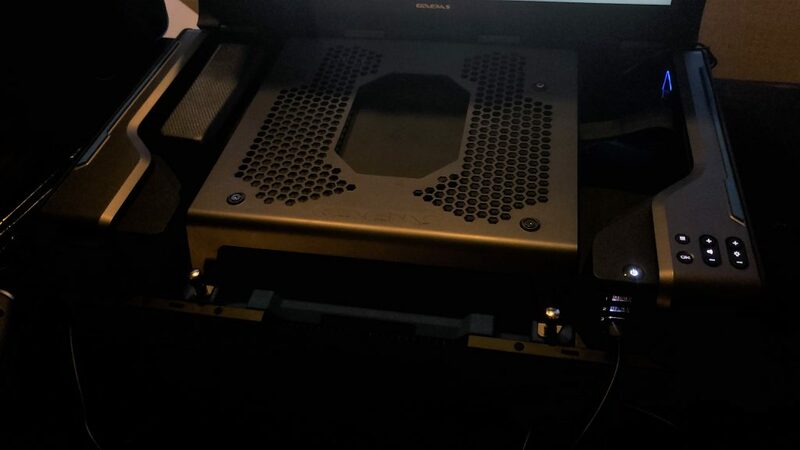 I mentioned to GAEMS how this unit would actually make more sense as a PC case, allowing you to transport a gaming PC around. 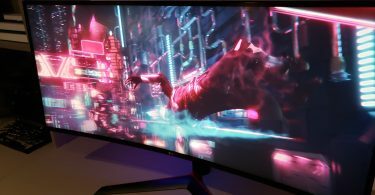 Though the 60hz refresh rate may be too low for satisfactory PC gaming. As this product is still in its prototype stage, many details such as pricing have yet to be announced. Many things can still change before this product launches. It’s planned for a spring or summer release in 2019.